I (regrettably) just came back from a beach getaway. During which I decided to let my skin soak in all the sun (spf protected) it could and use minimal to no make up. During this skin-restation period, I tried out the Earth Tu Face Voyage Travel Kit - featuring mini size Earth Tu Face products. 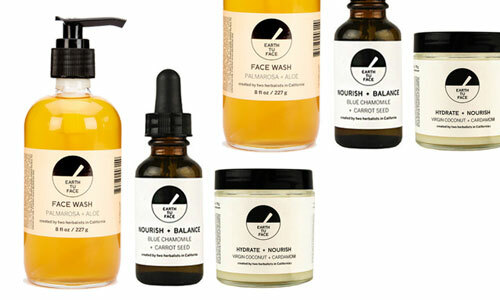 As the name suggests these products really are the earth, on your face. Earth tu Face was created by two herbalists in California, who took ingredients in their purest forms and created this line. Using them after stepping out of a steaming show does feel like herbal therapy thanks fo the light natural textures, refreshing and gentle formulas, and unmistakable aromas of earth. The cleanser, serum, and body butter provided in the kit were the perfect trifecta for my resting skin. As if I sent my face alone on a yoga retreat. An interesting note - the body butter uses coconut oil (love) and cardamom. The cardamom gives it a somewhat spicy decadent aroma. At first I was a little conspicuous of the scent but after using it a handful of times I decided, it’s really amazing. PS Click HERE to enter our #Giveaway with Commodity Goods!